Banana chocolate chip cookies are full of tasty flavor. Sweet soft bananas give this homemade cookie recipe a new twist to one of America’s favorite cookies. An easy cookie recipe, there is no rolling, cutting or shaping involved. Simply drop the batter by spoonfuls onto the baking sheet. 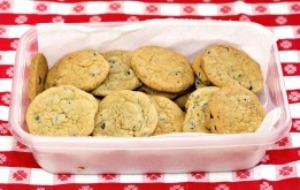 For even baking and easy clean up, line the cookie sheet(s) with parchment paper. 1. Preheat oven to 350 degrees F. Line cookie sheet(s) with parchment paper. 2. Sift together flour, baking powder, baking soda and salt. Set aside. 3. In a large bowl, combine butter and brown sugar. Beat at medium speed, scraping bowl often, until creamy. Add bananas, egg and vanilla. Continue beating until well mixed. Reduce mixer speed to low and add flour mixture. Beat until well mixed. Stir in chocolate chips. Drop dough by rounded teaspoonfuls 2 inches apart onto an ungreased cookie sheet. 4. Bake for 8 to 10 minutes or until the edges are lightly browned. Remove from oven and place cookies in a single layer on wire rack to cool.